The Sao Mao shop in Siem Reap’s Old Market area is a treasure trove of gorgeous handcrafted jewelry, accessories, fabrics and collectible curiosities. Many of those who fall for their merchandise might not realize the products’ beauty is more than skin deep. Sao Mao is owned by a British expat, Marie Hill. She works with impoverished villagers, home-based producers and artisans who survived the Khmer Rouge regime to help revive traditional craftsmanship with contemporary appeal — a project which she started in 1992 after engaging with Cambodians in a refugee camp. Seamlessly merging creativity with a social conscience, Sao Mao provides not just wearable pieces of art but also an opportunity to take part in Cambodia’s ongoing healing process. 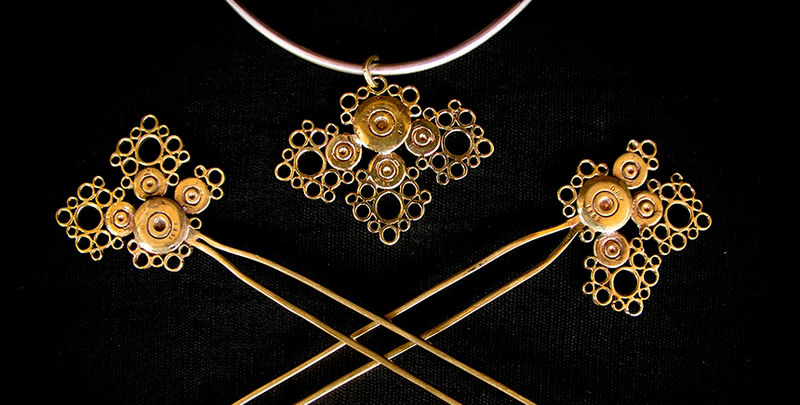 Among the notable products available at Sao Mao is Ammo — a line of jewelry handmade from recycled brass bullet casings. The woman behind the brand is Madeline Green, an accessories designer from England. Bullet casings were originally refashioned by locals into cowbells after the war. Artisans use the same technique to handcraft each of Madeline’s designs. Sao Mao, St 9 (opposite the Old Market); +44 7852 741 274; saomao.com. This article originally appeared in the October 2015 issue of Smile magazine.